I’m so glad you could join us today for an interview with Captain Kurt Heinz, OSS officer and hero of Casablanca: Appointment at Dawn. For those unfamiliar with his unit, the OSS (Office of Strategic Services) was the World War II precursor of our modern CIA. Casablanca: Appointment at Dawn tells the story of two people sucked into a vortex of intrigue and danger who must learn to trust one another in order to survive. Now, travel with us back to the year 1943 and visualize yourself somewhere in the English countryside at a very secret location not too far outside London. We are sitting in a first floor parlor, that’s the second floor to you Yanks, inside a red brick and stone mansion. The rather large room has been pressed into service as an office for military personnel. The windows of the alcove in which we are taking tea overlook expansive grounds dotted with oddly shaped and hurriedly constructed huts. People, in uniform and civilian clothes, rush to and fro. The place is a positive beehive of activity, but no one will say what kind. Bletchley Park, you suggest? Well I can’t really say, now can I? That would be telling tales out of school. LBP: Thank you for talking with us today, Kurt. We know that you are an OSS officer attached to British Intelligence and are recently returned from North Africa. We’ve heard something of your and Sarah’s story with regard to the Casablanca Conference. We would very much like to know more of your background. KH: Thank you, but if you know I’m with the OSS, then you know there’s only so much that I can tell you. Loose lips really do sink ships, you know. LBP: Of course. I’ll try to stay within acceptable topics. Should I be saying guten Morgan or guten Abend? I understand you speak perfectly unaccented German. KH: I do, but I prefer English. LBP: Excellent. I’ve just surpassed the limits of my German. Can you tell us how you came to be so fluent in a foreign language? That’s fairly uncommon for someone born in the United States. KH: Yeah, I know, but not if you’re from Texas. Everybody knows that Spanish is spoken there, but so is German and Czech. Over on the state line with Louisiana, they even speak a little Cajun French. LBP: Do you speak Czech and French as well? KH: Just a few phrases of each, but German was actually my first language. LBP: Fascinating. Tell us more. KH: My paternal grandparents emigrated from a tiny place called Telgte on the Ems River not too far from Munster. Opa Heinz’s older brother already had two half-grown sons by the time Opa married a youngest daughter with two older brothers. Neither of my grandparents stood a chance of inheriting any land and the only life either of them knew was dairy farming. Rather than work for his older brother for the rest of his life and have nothing to pass on to his own sons, my grandfather decided to go to Texas. LBP: But why Texas? When we think of German immigration to the US, it is usually Pennsylvania, New York, etc. Texas Hill Country near Boerne where Kurt’s family settled. KH: People from northwestern Germany have been immigrating to Texas since the 1830’s. They came for the land and because former neighbors were there. Most of them, like my grandparents, moved into communities where they already knew some of the people or knew some of their relatives back in Germany. There is a large contingent of German descendants in Texas in what is called the German Belt. It stretches from Galveston and Houston all the way to the far western edge of the Hill Country beyond Kerrville. Germans settled places like New Braunfels, Guerne, Fredricksburg, and Boerne, where I come from. LBP: But you haven’t explained why German was your first language. Were your parents born in Germany? KH: No, my parents were born in Texas, but here’s what you need to understand. Until just recently, people of German heritage sort of stuck together. When I was in high school, Opa nearly had a stroke when I dated a girl who wasn’t German. We have newspapers, schools, churches, and communities where German is the exclusive language. German kids are expected to marry within the community. German is spoken at home. Opa wouldn’t allow anything but German spoken on the farm unless you were talking to the farm hands. Then you mostly spoke a little Spanish. LBP: You must have been a child during the First World War. Did all of this make your life difficult? KH: Yes, it did. The kids and even some of the teachers weren’t very nice about it. You see, I didn’t go to the German school. It was the only time my father ever stood up to his dad that I know of. Papa insisted that we go to regular public school to learn English. He said we were Americans and Americans spoke English. He and Opa didn’t speak to each other for weeks before I started first grade. When America entered the Great War, the other kids called us Krauts, Square Jaws, Kaiser Kinder, stuff like that and the teachers let them. I got into quite a few fights over it. LBP: I take it your family was loyal to the Allies? KH: Absolutely. During both wars, my family has been red, white, and blue patriotic American. So have all the other German families I know, especially with this war. We are Americans who just happen to have German heritage, not the other way around. Opa and Oma’s generation have lost that battle for good. LBP: How did your grandfather feel when the U.S. entered the war against Germany in 1917? KH: He refused to talk about it. I guess he was afraid to show sympathy for anyone in Germany, even though I know Opa and Oma worried about their brothers and their families, the aunts, uncles, and cousins who were all still there. For two years, we couldn’t get mail to them or they to us. We didn’t know who had survived until after the Armistice was signed. KH: For the most part. Some of my grandparents’ nephews who had been soldiers didn’t make it. They were killed in the trenches. Another one came back from the front a cripple. He never walked again. Sadly for Opa, his older brother and sister-in-law died. The family said they both starved to death due to the blockade. I suspect the truth is closer to being disease and infirmity brought on by bad nutrition and old age. After all, they lived on a farm. It couldn’t have been as bad for them as people in the towns and cities. LBP: How did your grandparents feel about the deaths? KH: They were stoic as usual. It was war. Opa never said anything at all, but I caught Oma crying once out in the barn when she thought no one was around. LBP: Did your father serve in the Great War? KH: No. He was running the farm by then. Farming is considered an essential industry during wartime. LBP: I believe you went to Texas A&M. Did you study engineering? How did you end up in the OSS? KH: I graduated with a degree in history and a minor in English Lit. I wanted to be a lawyer, but I couldn’t afford law school, so I joined the army. I was a code breaker in the Signals Intelligence Service when we entered the war in ’41. Wild Bill Donovan himself came looking for me not long after that. Someone told him I spoke German like a native and looked like a poster boy for Himmler’s SS. LBP: And have those traits been put to good use? KH: I can’t answer that. I’ve probably already said more than I should have. LBP: I understand. Are you willing to speak about the lovely Miss Barrett? I hear she is quite fetching. Do you have any announcements for us? KH: All I will say is that she is someone I would willingly die for and almost did. Now you must excuse me. I have another appointment. LBP: Thank you, dear reader, for joining us today. 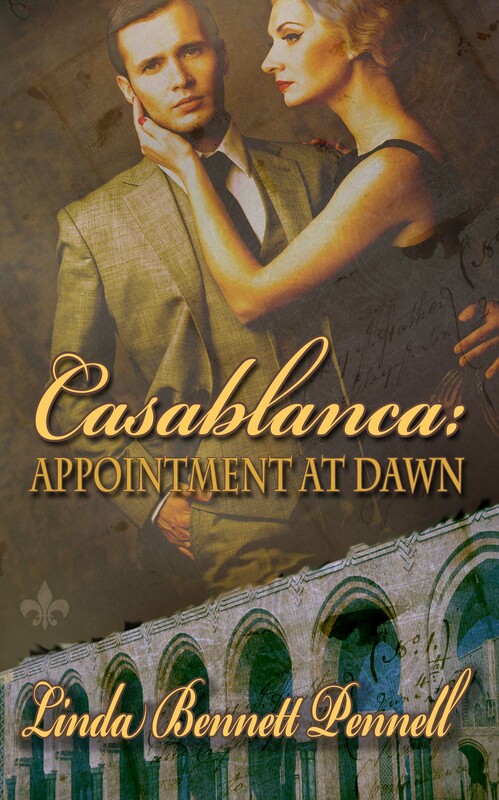 You can read all about Kurt and Sarah’s adventures in North Africa in Casablanca: Appointment at Dawn.